No, it is not a typo. This column will showcase a spectacular QDC process that fully and totally achieves true QDC with one-finger control. This system was designed, developed and implemented at Marwood Metal Fabrication in Tillsonburg, Ontario, and is one of its superb sensor-based technologies that will be presented in this column. To place the one-finger QDC process within context, it is important to first understand the foundation upon which it was built. Namely, a superb corporate-wide and mistake-proofed manufacturing system. Driven into a sharp focus by Chris Wood, the company president, its manufacturing culture is never satisfied with the status quo. The following comments are based, in part on remarks made by Jake Fehr, sensor applications specialist at Marwood Metal Fabrication. “Fully sensored dies lead to many great and wonderful things such as presses running much closer to their maximum speeds,” says Fehr. For example, one of Marwood’s dies, known as T-89, a two-out die that used to run at 30 strokes/min. with an operator at full alert watching the formed metal cups exiting the die, is now fully sensored including the feed, part out and slug detection. It now runs well at 70 strokes/min. and there is no operator standing in front of the press with their hand hovering over the E-stop button. In Fig. 1, taken shortly before the T-89 die was retrofitted with electronic sensors, a micro switch short-feed detection mechanism is visible at the top. The die was thoroughly analyzed and marked up as needed during brainstorming sessions between the sensor department and the toolmakers. Thorough sensor monitoring was implemented for short feed detection, part ejection (two sensors mounted within the dual track exit ramp as seen in Fig. 2) and slug detection with stripper monitoring towers incorporating sensors. The sensor cables were carefully buried within the tooling and routed to the centralized connector box as seen in the upper left of the photograph. 1) The average die speed increased by 25 percent. 2) The die runs unattended without constant operator vigilance or attention. 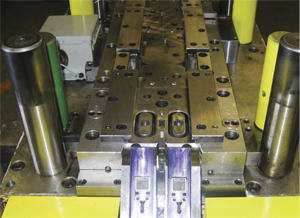 To maximize the running speeds of fully sensored dies, a careful study was done to assess the stopping times of the presses that were used to run the newly minted die sensor applications. 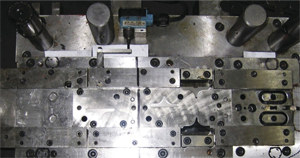 It was determined that the brakes on the presses were not fast enough to halt the die at fast running speeds—even though the electronic sensors detected a problem. This was solved by augmenting the braking mechanisms with secondary brake installations that dramatically shortened their stopping times. Thus the full-sensored dies now could be run on these presses at maximum safe running speeds. train-like configuration. During die changeover, the bolsters are air lifted and air shuttled into and out of the press. The entire process is activated via an inhouse, custom-designed control system activated with one-finger buttons. The average full changeover time is 90 sec., including the auto shut-height adjustment. The dies that run within this system are fully electronically sensored. To overcome the need for manual sensor cable changes, a wireless sensor interface was incorporated, eliminating the need to run sensor cabling from the bolsters to the press. Fig. 3 shows a die within the press that had just completed its run. 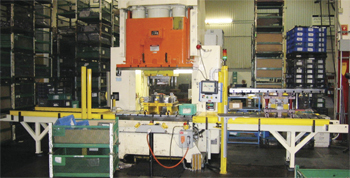 To the right is a die with the magnetic bolsters pre-attached and waiting to be shuttled into the press once the previous die is removed and returned to its staging position—left of the press. The system is fully automatic and requires only one finger to actuate and control. To see how this revolutionary quick-die-change process works, go to www.you-tube.com/watch?v=ef_44PXCtsM, where the process can be clearly seen and understood.